You got to go way back for video footage like this, but it is well worth it. You Really Got Me, The Story Of The Kinks is a hour and a half of the story of what some have called the ultimate British rock band, The Kinks. The tumultuous tale of Ray Davies, his brother Dave and their band’s revolving door membership has been told in other more accurate ways, but this DVD is more concerned with showcasing some truly early Kink footage, like the band playing “Got Love If You Want It” and “Death of a Clown” and “Milk Cow Blues” right through their seventies stumbling (Davies always wrote great songs but the Kink’s were banned from America for so long they never formed a bond on our shores like The Stones or The Who did) to their later 80’s and early 90’s output. There’s a good amount of interviews with the band through specific stages of their career, some neat backstage footage, but the later concert footage like “The Hard Way” and “Low Budget” is especially nifty. There are the obligatory videos included here too, like “Come Dancing” and “Do It Again” though I’m not sure we need them. I’d much rather have had more rare footage or interviews. 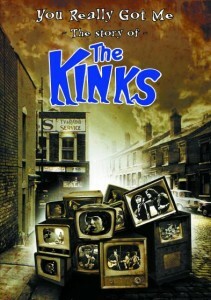 If you’re a Kinks fan this DVD is a must-have. If you have some passing interest, it might be time for you to educate yourself.